Painting the ocean forces the artist to confront a reality that in its dynamic flux, defies our attempts to fix it as an image. Why is the sight of the sea so infinitely and eternally attractive? Because the sea simultaneously provides the idea of immensity and of movement… Twelve or fourteen leagues of moving liquid suffice to provide the noblest idea of beauty that is offered to man in his transitory habitation. No one can look on the sea and not feel the vastness that lies there. Here exists all the elements- the surging water, the pounding and echoing of the surf against the rocks, the oratory force of the fury of sea, the uplifted spray in one’s face, the intense isolation of boat or gull suspended on that moving surface. This space is all-consuming and complete. One is intensely caught in reverie, yet fully engaged, losing oneself in all that immensity. There is also an aspect of terror that adds to this sublime feeling. The sea demands respect and adoration. Menace is also an attribute -don’t venture to low onto rocks that are daily covered under the sea, one may not get back. The sea is all these things, and it is its ability to surprise and astonish that causes one to feel the sublime. 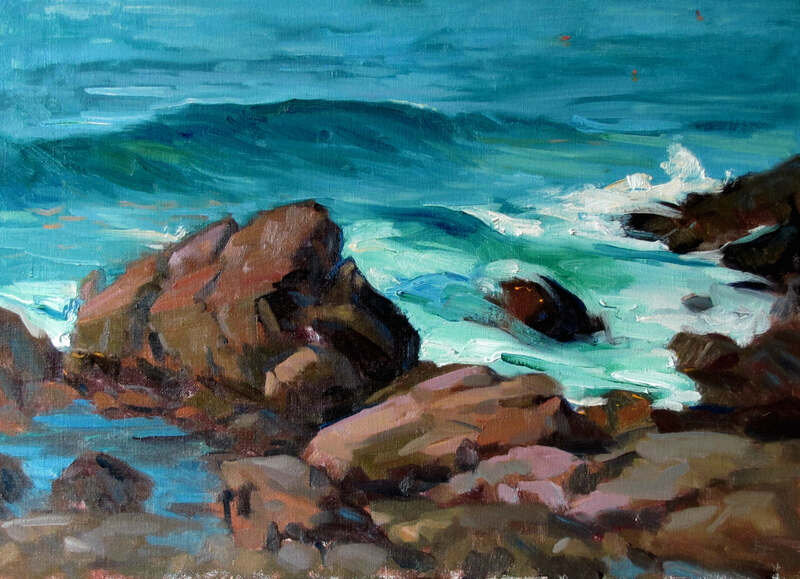 As I was engaged in painting on rocks above an incoming tide, I was hit by a rogue wave that nearly took my easel out to sea. It was unexpectedly high and seemed to come from nowhere. There was a bit of terror in it, riveting my attention. The mobility of all that water, its labyrinth like quality, which one is constantly attempting to discern and unravel, is sublimity itself. And it is all this action that I was yearning for, to capture what is in, a way, impossible. It is flux itself, like life, like time. We only delude ourselves into thinking that nothing changes. The sea is the witness that speaks otherwise. I found myself drawn to the movement of the sea between an immense dark black rock jutting up from the sea bed and coastal rocks receiving the buffets of the incoming high tide. I painted this same section many times in the afternoon, later and later each day as the peak of the tide changed. It seemed to contain all that I wished to discover there. It exemplified that constant “irregularity” in that ever-shifting, vast fluid surface, where one could only receive a feeling of orientation through the position of the visible rocks. “I have discovered the definition of beauty- of my beauty. It is something ardent and sad, something slightly vague, giving rein to conjecture.” (Baudelaire) It is something ill-defined, indefinite with a perplexing emotion carrying it. Yet one intuitively recognizes it as one’s own, as if one had suddenly remembered long ago, in vague and coherent flashes, feeling this way before. A lost memory found. This is the real goal of painting- tapping into that “store-house of images”, that returns us to a more profound place that resides within ourself. The spectator, when viewing a painting, completes the image himself. This is the main reason for not entirely completing an image, but to leave some parts more generally indicated. It leaves the door open for participation from the viewer. Sir Joshua Reynolds states in his Discourses on Art that, “From a slight undetermined drawing, where the ideas of the composition and character are, as I may say, only just touched upon, the imagination supplies more than the painter himself, probably, could produce; and we accordingly often find that the finished work disappoints the expectation that was raised from the sketch…” (Eighth Discourse of December 10, 1778). Water cannot readily be rendered and when it is, it rings false or photographic. 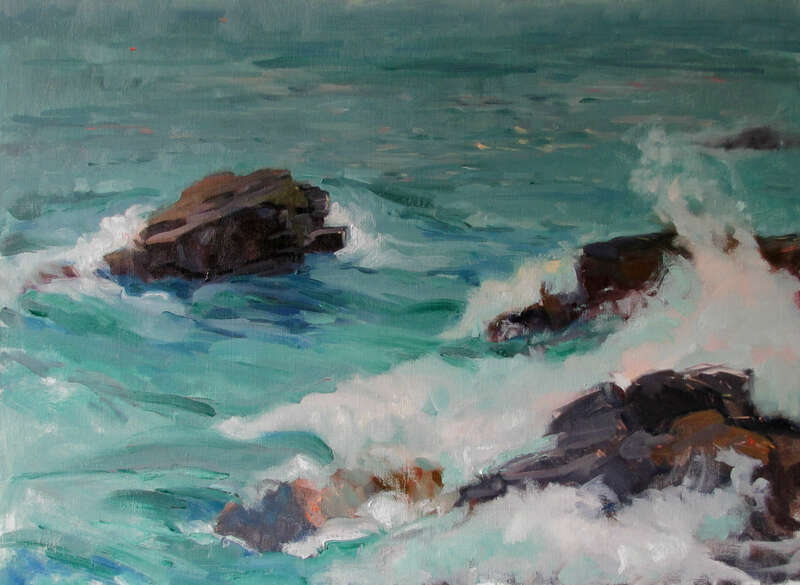 Having the attribute of a sketch, the sea feels authentic and true, full of life. One inherently knows what the sea is and one can easily complete the image with one’s imagination. The artist provides the tools for that meditation. 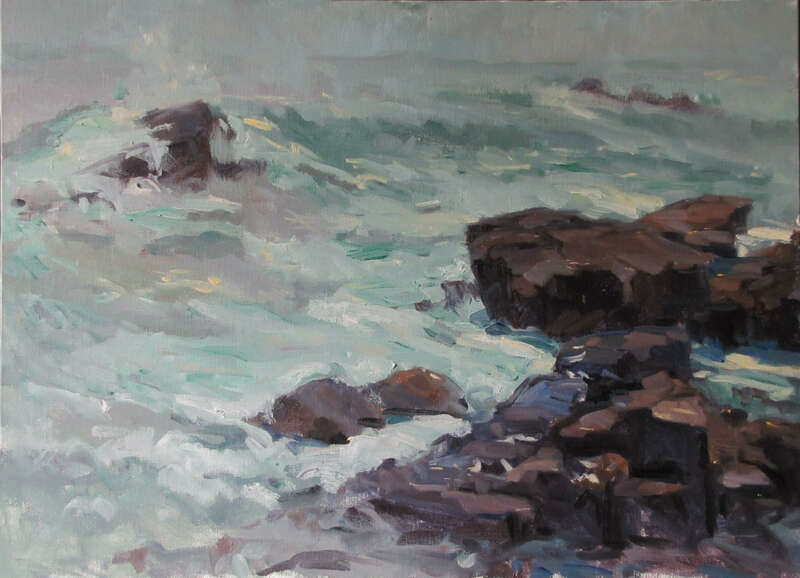 With these ideas, which I have reflected upon behind the work, I share some paintings from Maine.